The winner of the 2018 Marco Biagi Award is Matteo Avogaro, Ph.D. researcher, University of Milan, Italy, with his paper entitled: “New perspective for workers’ organizations in a changing technological and societal environment“. On behalf of the IALLJ, the committee congratulates Matteo Avogaro with the Award. For more information and Table of Contents, or to purchase the Yearbook, please visit the Lancaster House online bookstore. The next annual meeting of the IALLJ will take place at the occasion of the world conference of the International Society for Labour and Social Security Law, organized on 4-7 September 2018 in Turin. 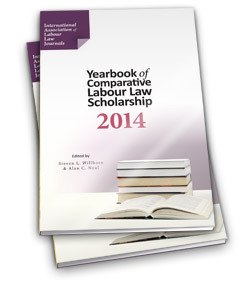 Promoting closer relations among editors of national and international labour and employment law journals. The late renowned Professor Marco Biagi of the University of Modena, Italy was the first President, and was instrumental in establishing the Association as a Club of Labour Law Journals. During the tenure (2004-2007) of his successor, Jeffrey Sack, Q.C., the Club was reconstituted as an Association, and its membership expanded from 12 to 21 Journals. At the same time, the website for the Assocation was established. As of 2015, there are 27 member journals. Papers prepared for Association meetings are published by the Comparative Labour Law & Policy Journal and by The International Journal of Comparative Labour Law and Industrial Relations. Delavci in delodajalci – Revija za delovno pravo in pravo socialne varnosti (Employees & Employers – Labour Law and Social Security Review) (Slovenia). Derecho de las Relaciones Laborales (Spain) (considered by the IALLJ as the academic successor to the journal Relaciones Laborales, which was one of the original members of the Association, but which ceased publication in December, 2014). More information will be made available on the IALLJ website. The IALLJ announces a Call for Papers for the 2018 Marco Biagi Award. The Call requests papers concerning comparative and/or international labour or employment law and employment relations, broadly conceived. The author or authors of selected papers will be invited to present their work at the association’s 2018 meeting, which is to be announced soon on the website of the Association. The deadline to submit an expression of interest is March 31, 2018. The current president is Frank Hendrickx of the University of Leuven Law Faculty.